Hello all, glad that I'm able to blog again. Was really busy last few weeks due to my mid term exam. 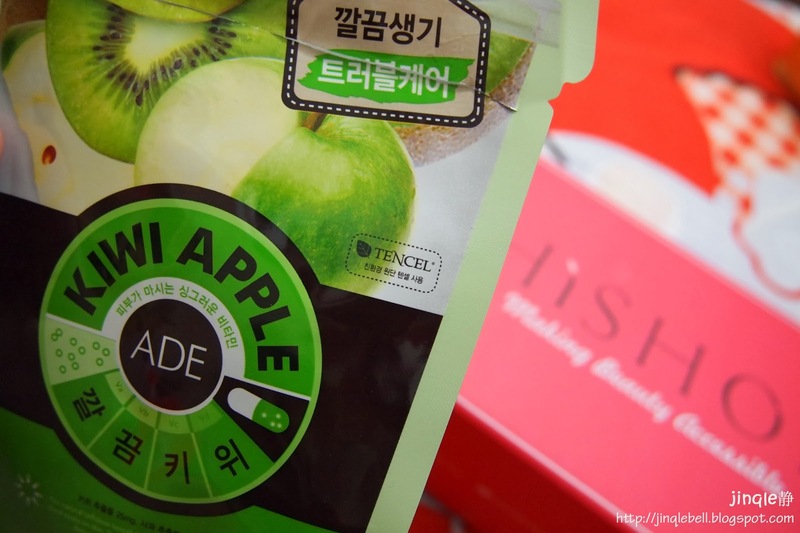 Today, I'll continue to review the second mask from previous Magnificent Mask Giveaways by HiShop.my. ! 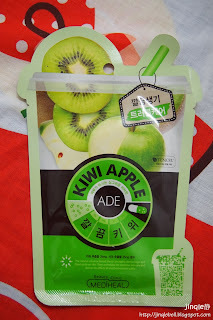 So, what exactly is Mediheal Kiwi Apple Ade Mask? Real the benefits of Fresh Apple and Soothing Kiwi Extract to help cleanse and smooth troubled skin. Tackle common skin problems and early signs of aging. 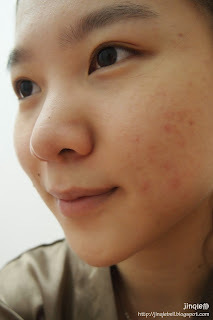 Helps with skin immunity level & diminishes pimple scars. Those who know me will know that I have a face full of light pimples scars on both cheeks due to serious skin problems i had before. 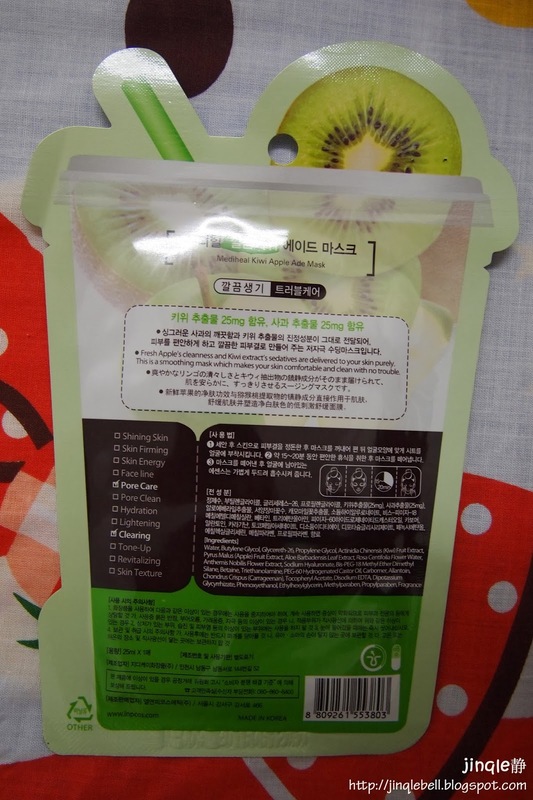 I was really happy when I receive this mask knowing that it could diminishes pimple scars! The one i received is in Kiwi Apple, other than that, there is also pomegranate, pumpkin, cacao, lemon lime and acai berry. I've heard of the Vitamin C content in Kiwi, so I think perhaps it is the one that helps to reduce the appearance of scars. 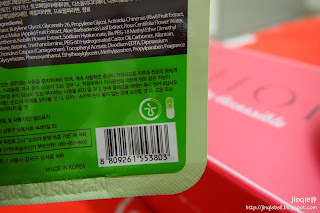 Also, on the back of the packaging, written that there is pore care and cleansing properties too. I noticed that the mask is made of Tencel, which is actually Eucalyptus fibre. Best known for it's absorbency, hygiene and temperature regulation. Also, it is Naturally hypoallergenic. 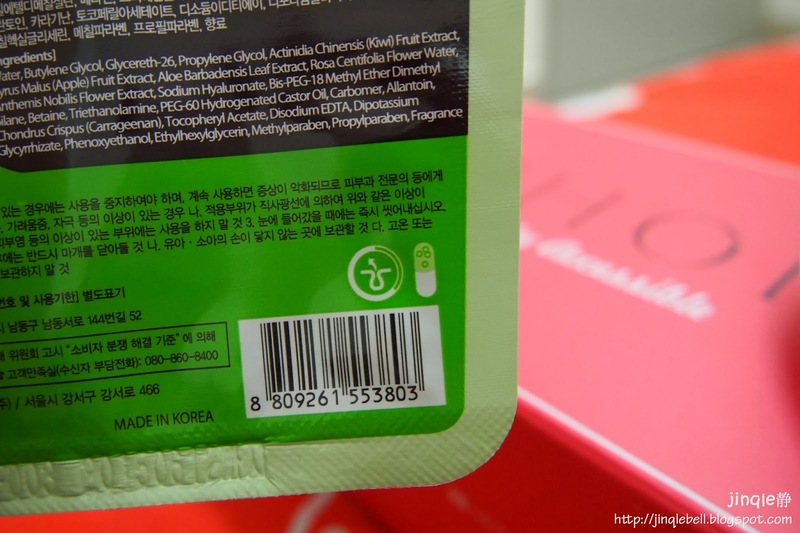 The overall feel of the mask is thicker compared to those in drug store. There is DNA-like shaped on the mask. The mask is well absorbed in it's essence and there is no residue in the package when i removed it out. For me, it smells like those Apple hand soap/ bathing gel. Similar to those of children. It smells rather sweet compared to previous Bidanpo Mediental Balhyo-Mibaek Healing Mask I reviewed. Also I noticed there is two symbol above the barcode. The first one look like something being removed from pores, indicating it's pore cleaning function i guess. Second one is of a pill like symbol. I think it's because of its healing properties. The mask fitted well on my big wide Asian face. However, due to it's thickness. 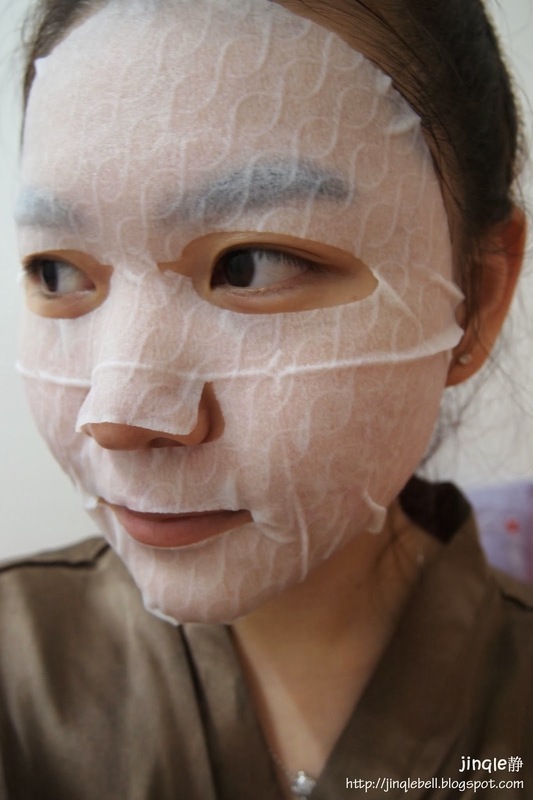 It don't feel like there is nothing on the face, compared to other thinner mask. Like other mask, the direction to apply is similar. 1. Cleanse your face with facial cleanser, and prep skin with toner. 2. Remove mask from package and place onto the face. 3. Rest comfortably for 10-20minutes and remove. For me, I leave it for 20minutes. Surprisingly, there is still a lots of essences in the mask. It does not dry up like some others mask I've tried. 4. Pat remaining essence into the skin lightly until fully absorbed. For me the 4th step is really important as it helps your skin to further improve the essences. Also, patting the skin lightly will help the skin to absorb better by making the cell to reshape into round shape rather than oval shape and block the passage to deeper side of the skin. I really don't know how to explain this but all that I know is it is really good to pat your skin. 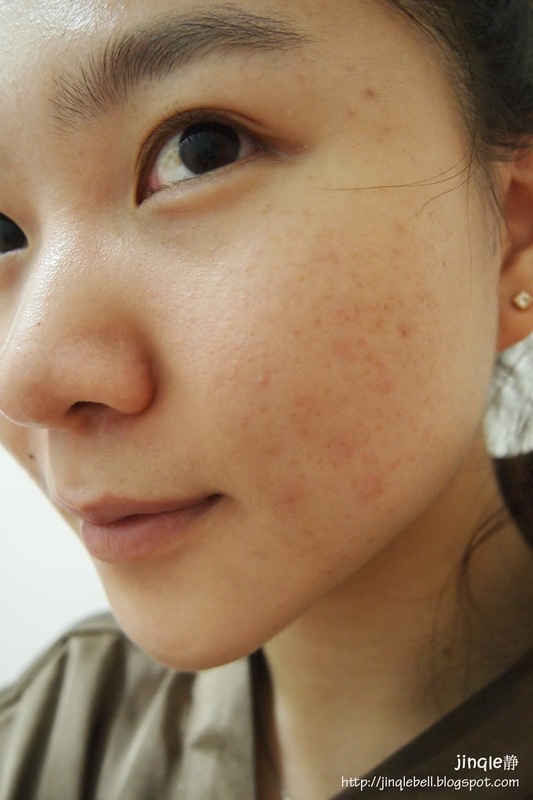 First was my bare face before application, Second(the brighter one) was after application. The result is not really accurate from photos due to the lightning although I snap the photos from a same spot. However, what I think was my skin got brighter and glows with radiance but sadly, I can't see any improvement on the scars. For anyone that is interested, the mask is priced at RM4.50 per pcs on Hishop.my! cheaper than Bidanpo Mediental mask! Also, free shipping for any purchases above RM50. Not to forget free gift for purchases above RM300! 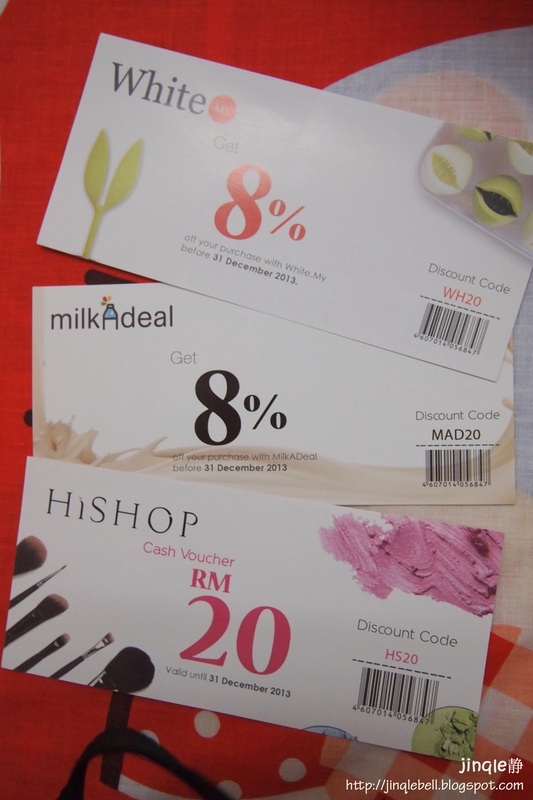 Here are some exclusive vouchers for my readers for purchases on MilkADeal, White.my and also HiShop.my! Also, special RM20 off for my readers! Type in HSMASK when checking out from HiShop.my with minimum purchase of RM99. (Valid until 31 October 2013) Act fast! Check out my Bidanpo Mediental Balhyo-Mibaek Healing Mask too! Reap the benefits of Fresh Apple and Soothing Kiwi Extract to help cleanse and smooth troubled skin. Tackles common skin problems and early signs of aging.